Lovely House in Black Jack on 5.3 Gated Acres! Retreat to 5.3 acres of paradise at this 5-bedroom, 3-bath vacation rental house in the Black Jack countryside. Classic architecture and an updated interior make you feel like royalty in the 2,900-square-foot living space. With accommodations for 16 but a max occupancy of 20 guests, invite everyone to fish and relax at this memorable getaway. 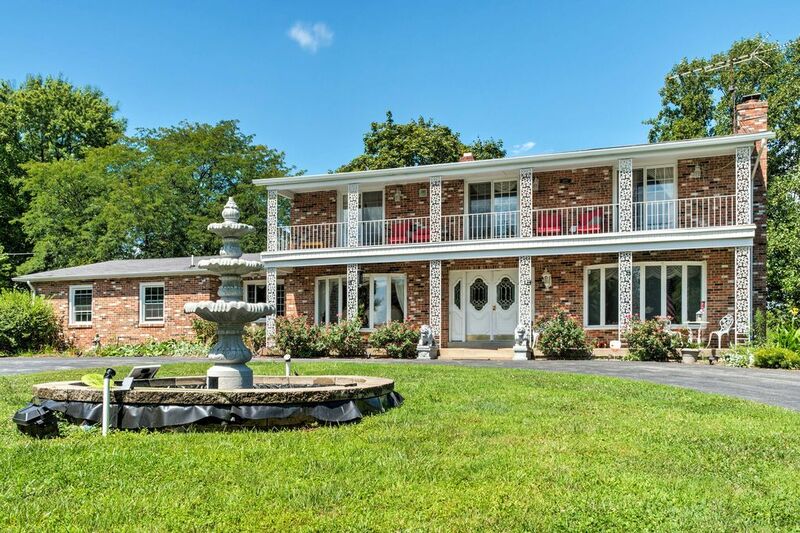 The property sits close to golf courses and the Missouri River, while only being 30 minutes from St. Louis! You'll reach this house through a gated entry that will open up into the spacious and beautiful landscape surrounding the property. After passing the private fishing pond, a drive up the road reveals a classic and elegant house. Step inside the doors to find a living area and dining room that follows the elegant exterior. Throw logs in the fireplace and relax in the living room as the self-proclaimed chefs of the family head to the kitchen. Cooking for a crowd will be easy with the stainless steel appliances, large granite counters, and ample cabinet. When you're ready to eat, you have a couple dining spaces to choose from. Head into the dining room for the formal meals, into the kitchen for early morning breakfast, or downstairs to the entertainment space for dinner and a show - whether it be a movie on the projector screen or watching your friends attempt a game of pool. Also in the entertainment space is a second room with a flat-screen TV and children's games for hours of fun. If that's not enough entertainment, a trip outside will promote endless possibilities with a basketball court and private fishing pond. While the kids are off exploring the grounds, the adults can hang back and sip drinks on the wooden deck 'tiki bar,' or take a spot at one of the picnic tables to keep a close eye on the ribs cooking on the grill nearby. When you're finally worn out from the fun-filled day, head off to rest for the night. Parents can choose between a queen bed in the master with an ensuite bath or one of the plush queen-sized beds attaching to the front-facing balcony. The tired kiddos will be ready to hop into one of the additional pullout couches for a restful night. Spend some time off the private grounds and on the public greens. Florissant Golf Club and Eagle Springs Golf Course are both less than 10 minutes away for those who are hoping to book a tee time and walk the lush Missouri landscape. If you're ready to graduate from the private fishing pond to bigger rushing rivers, drive over to the Columbia Bottom Conservation Area. Here, you'll have access to prime fly fishing spots on the Missouri River. Enjoy the fresh currents until you catch enough fish to feed the whole family! Take a day trip down to St. Louis to tour the big city just 30 minutes away. Marvel at the famous golden arch, wander the state botanical garden, or take the kids to the St. Louis Zoo! Pair these attractions with unique local dining and shopping for a day that everyone can enjoy. - Amenities include free WiFi, a fully equipped kitchen, 4 flat-screen TVs, a wood-burning fireplace, pool table, private hot tub, fitness room, gas grill, basketball court, private fishing pond, 6 parking spots, and much more! The property has a large grassy area with a basketball court and recreation equipment to match. We had a ball playing and enjoying it. The pool is being repaired. The home is decorated in a formal English touch. We had my parents and three of our children stay with our grandchildren with a place for everyone to sleep. There is a basement with a pool table and large screen television. All of the other bedrooms had a TV, small refrigerator and some have a microwave. We cooked Thanksgiving dinner in the kitchen with plenty of room to sit at the formal dinning table. The host even provided a small bounce house for the grandchildren. We all loved the house. There was more than enough room for the 16 of us. Marie was very kind and helpful. The only criticism I have is that the house needs one more shower. Would definitely stay there again. What a lovely taste of paradise nestled in a private place of its own - thank you for allowing us to stay! My family consisted of 18 people and there was plenty of room for all of us. The peacefulness and isolation within the neighborhood was great. We were able to find everything we needed to cook our meals and to clean up afterwards. The adults spent a lot of time on the deck while the children enjoyed the yard. Marie was fantastic, making sure everything was ready for us and left treats of snacks, cupcakes and lemonade for us. She checked in with us regularly to see if we needed anything (by text or phone) even though she was not able to stop by the house during the week. We traveled from Black Jack into St. Louis several days within our week stay and had no issues getting to our destinations and back in a reasonable amount of time. Two suggestions, because we were such a large group: a bed in the basement room instead of one of the sleeper couches and a larger waste basket in the kitchen would have been nice. We thoroughly enjoyed our stay on this beautiful property and would not hesitate to rent it again. We all enjoyed this property very much (there were 8 of us). It was a sad time for us as I met my three brothers and my father for my mothers funeral. We all traveled from different parts of the country and were able to be close together at this time in a far better way than any hotel could offer and the price was great . Everything was within a half an hour from the house so it was peaceful and private and still in the area of the local attractions. We saw a deer,frogs a snake and fireflies. Being from Alaska the snake and the fireflies were quite a treat. Marie was a wonderful warm host throughout our stay. We would definitely stay here again. Friendly manager. Lots of room. Great patio. Enjoyed our stay. Patio was a great spot to hang out with family.